into a mould. It will turn out for ____ use next day, but if it is to be kept, put a paper wet with spirits over it, & cover it with paper, as ___ other jam or jelly. Grape Marmalade Pudding Take 6 ozs of Marmalade, 1/2 lb. 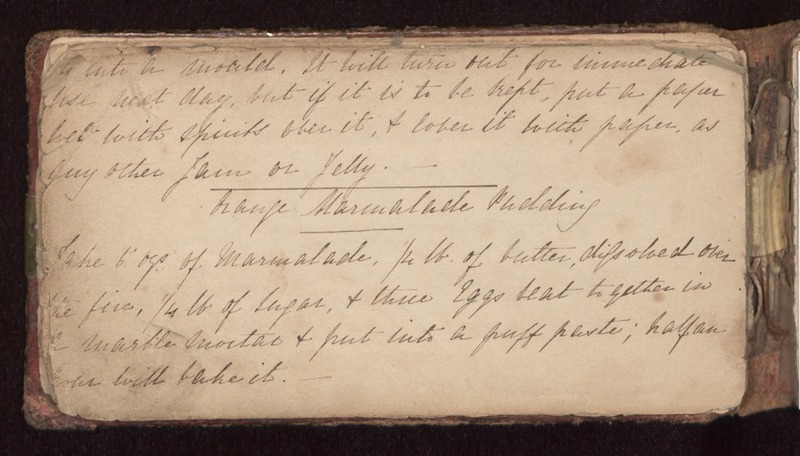 of butter, dissolved over the fire, 1/3 lb of sugar, & three eggs beat together in a marble morter & put into a puff pleste; half an hour will bake it.